Imagine waking up in the morning eager to go to work. The harmony between you and your co-workers makes for a happy work environment. The challenges of accomplishing tasks are easy because you have a supportive boss. The sales team communicates with you and your colleagues so that production happens with a seamless co-operation. Lunch-time talk is discussing one another’s families and your hopes for the upcoming evening with them. Imagine going home and enjoying conversation around the dinner table with your loved ones. Laughter, inside-jokes, hilarious stories about the day’s antics are shared with great food and great fun. Everyone lingers at the table, enjoying the time and staying in their chairs to put a puzzle together. Imagine getting out of bed on Sunday morning with joyful anticipation in your heart of worshiping God with people of like mind. You know the interaction with fellow believers in Jesus will be open, honest, sweet, and full of grace. The wonderful relationships between God and people will be celebrated at the Lord’s Table…. It could be that somewhere in those descriptions you pursed your lips with a “ppfffff” – like that’s gonna happen!” That’s because you feel drained from the lunch-time gossip gab session at work; you couldn’t wait to finish supper at home because of the bickering between your kids at the table; and, you drag yourself out of bed on Sunday out of duty, knowing that the Lord’s Table will be just another ritual to do with people who don’t talk to each other across the divided aisle. There is someone who understood this reality first-hand, and knew that it really could be different – it could be a new reality that fulfills, even exceeds your imagination of harmony and unity. The Apostle Paul wrote a letter to the 1st-century Corinthian church to emphasize that the work of Jesus on the cross effected what we call “reconciliation” between God and people, and between each other as people. This means that God, in Christ, has restored relations between us and God, and between one another. The relations between the Corinthian believers had broken down into special interest groups, and there was no interaction or fellowship or participation between those various factions. People basically just hung out with others who thought just like them, and did not care about what other people in the church thought; each group wanted their own way, and they had not yet learned how to work together and have true unity and fellowship with each other. Participation in Christ, and participation with each other is the result of the reconciliation that has been applied to us because of the cross; and, it is this reconciliation that brings unity or one-ness to your church, to your workplace, and to your family, allowing you to work together and play well with others. So, when we come to the Lord’s Table, it is this truth that we celebrate, enjoy, and re-create together. Jesus is not just someone we remember, but someone we participate in through the Lord’s Table. Sharing the Table together brings healing and forgiveness, and builds up our faith so that we might joyfully live in the reconciliation that Christ has brought us. Therefore, we must live up to what we possess – our participation in Christ results in participation and fellowship and unity with each other. Since we are forgiven, we work at being harmonious at church, at work, and at home. 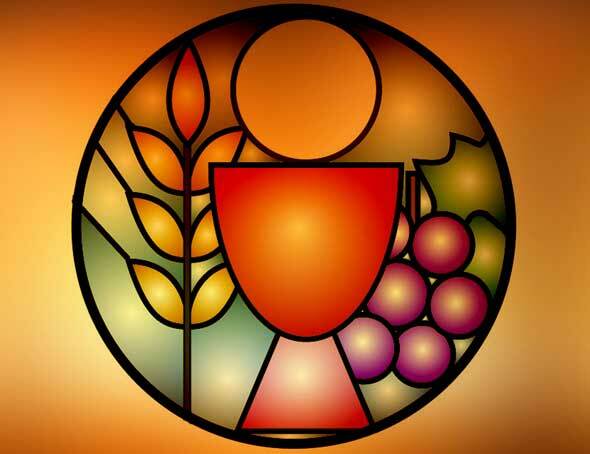 This is symbolized by partaking of the same loaf of bread, and drinking from a common cup. Peace, harmony, unity, and fellowship begins with Jesus Christ. Workplace enjoyment will happen with an intentional development of encouraging language on your part, based in your participation with Jesus. Family harmony will come when you seek to live into the reconciliation bought for you with Christ’s body and blood. Church unity will exist when you make things right between you and God, and you and others with the cross always at the forefront of your mind and heart.